Michigan's offense showed the critical growth it has made since last season in a commanding win over Wisconsin in the Big House. Since Jim Harbaugh took over at Michigan in 2015, the Wolverines have never been able to find a consistent rhythm on offense, and it’s held them back. On the other side of the Big Ten, Wisconsin has fielded elite defense after elite defense, which has elevated it even when its offense has struggled. On Saturday night, though, both teams moved beyond those identities. In its 38–13 win over No. 15 Wisconsin, Michigan put up more points than any team has on the Badgers since Penn State scored 38 on them in the 2016 conference title game almost two years ago. After a Week 1 loss at Notre Dame, Michigan fell from the preseason No. 14 team to No. 21. Since then, though, it’s won handily against every opponent but Northwestern, which it edged by three. Wisconsin was the Wolverines’ first test since opening weekend, and they passed it with flying colors. In his seventh game in the maize and blue, quarterback Shea Patterson was 14 of 20 for 124 yards. He also rushed for 90 yards—the bulk of which came on an 81-yard run—and a touchdown, part of a 320-yard rushing effort by the home team. The 81-yarder, which set up Michigan’s first touchdown of the night, was the program’s longest run since a Denard Robinson 87-yard touchdown in 2010. On the other side of the ball, the Wolverines effectively limited Wisconsin’s chief offensive spark, running back Jonathan Taylor, who had 101 yards, his worst performance of the year. Alex Hornibrook completed just seven of 20 passes and threw two interceptions, looking more like the Hornibrook of years past than the quarterback we’ve seen this season. All in all, Wisconsin had just 11 first downs, and for that, Michigan’s defense deserves as much credit as the Badgers’ offense warrants blame. In Harbaugh’s fourth season, there was a sense going into 2018 that it was now or never for this iteration of the team, which won eight games last year after two consecutive 10-win seasons to begin the coach’s tenure. It snagged Patterson, who was granted immediate eligibility, but even that left questions. Could a new quarterback be all Michigan needed? Maybe—but its offense has developed too, away from the predictable attack of a year ago. And with a defense as talented as the Wolverines’, Harbaugh’s team might just have the pieces it needs to contend. 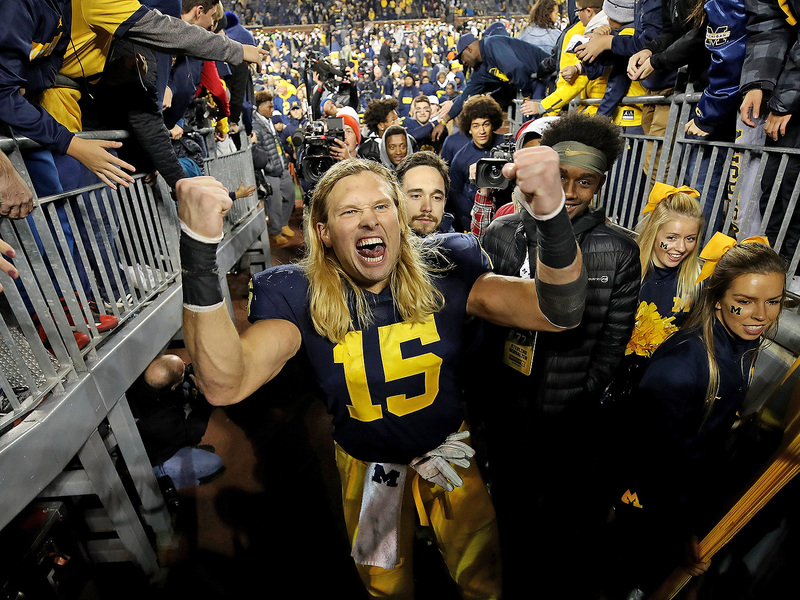 “The revenge tour has officially commenced,” Michigan defensive end Chase Winovich said after the game. Wisconsin is still alive in the Big Ten West; on the weaker side of the field, it joins Northwestern, Iowa and Purdue with one conference loss, and it seems realistic, even likely, that the Badgers will make it again to the Big Ten title game. There, though, unlike in past years, it’ll only be able to play spoiler. A one-loss Badgers team missed the playoff in 2017. Michigan, though, is very much alive in the East—even more so, perhaps, than it was Saturday morning. Ohio State won, remaining undefeated, but Penn State’s loss to Michigan State was its second conference loss. Only the Buckeyes and Wolverines are without a Big Ten loss, and should Michigan make it through the next three weeks (it has Michigan State, a bye, then Penn State) unscathed, it’ll more than likely battle Ohio State for the division on Nov. 24. It’s easy to imagine the winner of that game edging its way into the playoff—and at the very least being the Big Ten’s best shot at the final four.